Radius rod ball cap mounting set, 7 piece set, includes studs, springs, castle nuts and safety wire for locking the nuts and studs in place. 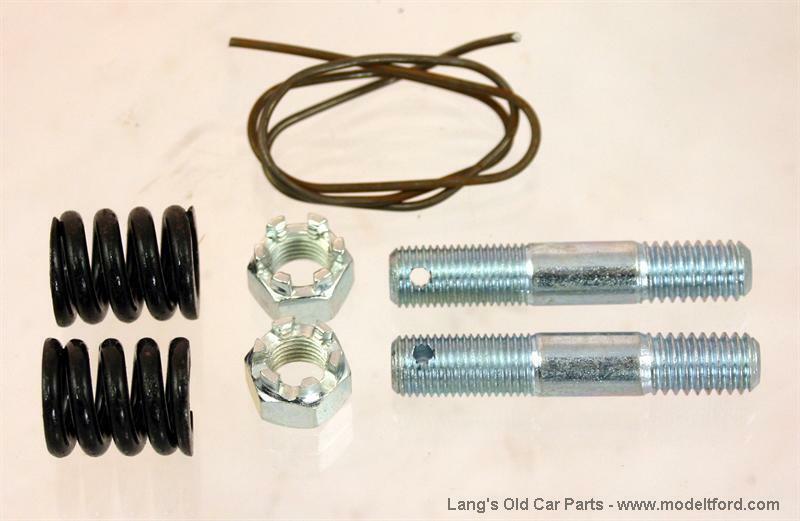 (using cotter pins will not prevent the hole assembly from unscrewing out of the pan) Lang’s Tech Tip! If your socket in you oil pan is severely worn out and the ball of the wishbone goes to deep into the socket an easy fix is to purchase a freeze plug to shim the wishbone out. make sure you only put it between the wishbone and the oil pan (not the cap and wishbone) so the front end alignment will not be thrown off. Engine pan arm wood block, (crank case arm). Engine oil pan arm mounting bolt set.